WA Samphire (aka. sea asparagus, swamp grass, glasswort, pickleweed, sea beans) is a delicious salty treat that’s high in vitamin A and a good source of calcium and iron. Samphire is a protected native salt-tolerant succulent that plays a vital role in our coastal ecosystem. The young, green shoots are crisp and crunchy in texture, similar to asparagus, giving a fresh, sea-salt burst of flavour. Enjoy these raw, sautéed or quickly blanched and tossed with olive oil and lemon. Samphire is considered best for use in Summer when the succulent ‘leaves’ are pale green and aromatic. Though the leaves turn pink in winter, any green remnants may still be blanched and eaten. Serve with seafood; in salads, pesto or salsa; or use as a garnish. Harvesting the tender new shoots will offer the best flavour without compromising plant growth. This WA native requires less moisture than many other samphire species, and will continue growing with little fuss. However, a deep, occasional watering will improve the quality of new growth. 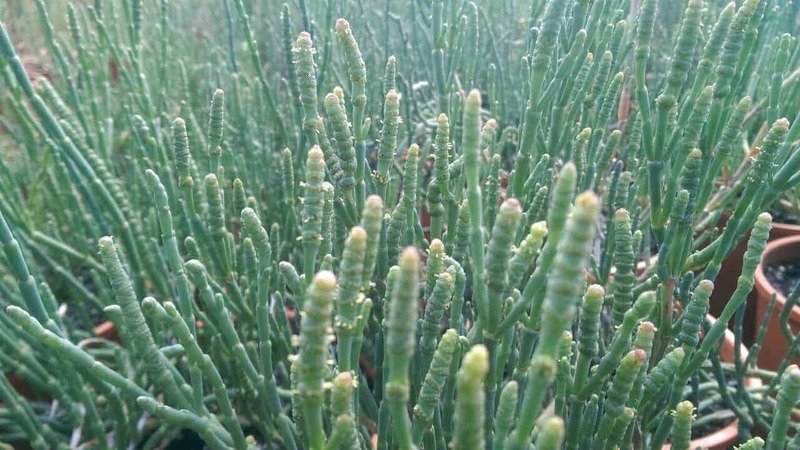 WA Samphire is adapted to a range of conditions, but does best in full sun or part shade, planted in sandy, free-draining soil. 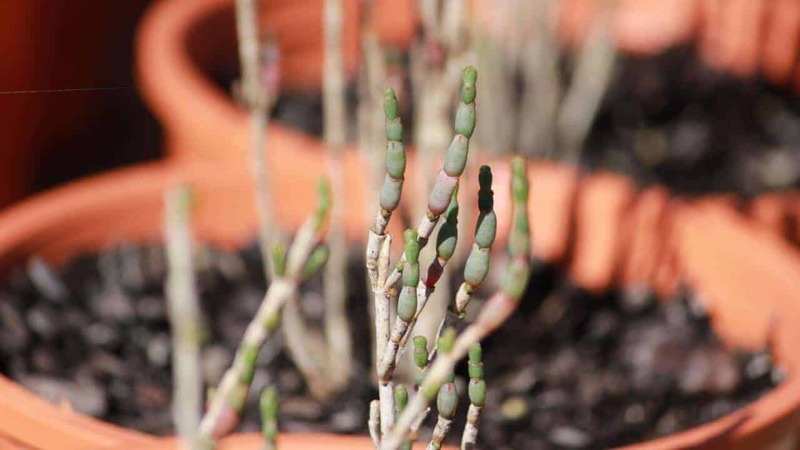 New shoots are fleshy and green in colour, and grow upright as the plant sprawls outwards. Plant grows to 50cm in both height and width when grown in the ground, but may be kept small in pots with regular harvesting. Will provide shelter for small birds and lizards if planted in dense numbers. Why are my samphire leaves turning reddish brown? 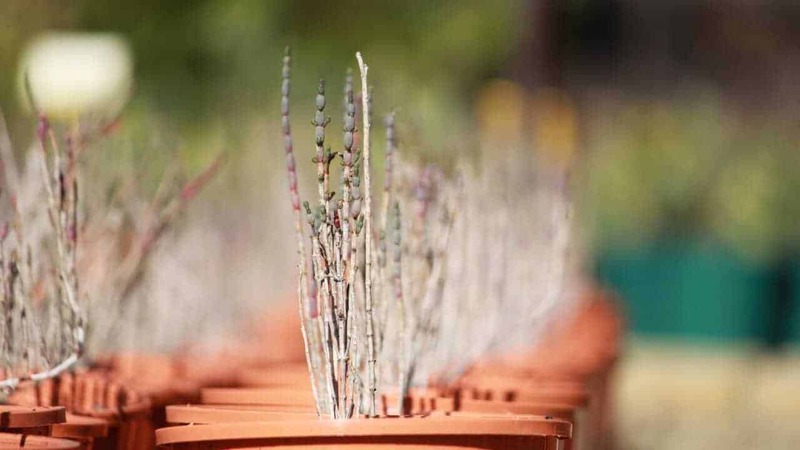 WA Samphire goes dormant in winter, so don’t panic if your plant looks a bit straggly and woody at this time of year. Give it a hard prune in spring to regenerate the shrub. What’s eating my samphire plant? Your neighbour! Samphires don’t suffer from many pests or diseases, so your only competition are other grazers and foragers. What are the tiny spots on my samphire leaves? What we call ‘leaves’ on a succulent are actually more like modified stems used for water storage. Unlike leaves where spots may be a cause for concern, the ones you see on your samphire are nothing to worry about.